Austin Aerial Park View - Another aerial look at the Austin skyline from the Vic Mathias Shores along the Butler hike an bike trail. The crane finally came down on the new independent high rise are as some call it the Jingle building now the tallest building in the city at least for now. A taller building is schedule to break ground later this year so new crane will rise soon that why we had to catch this before the city is full of cranes again. Austin has added so many new high rise buildings along the shore line including the new Spring building, the North shores apartment building, google building just to name a few. You can hardly see the Austin 360 any longers because of all the new high rise skyscrapers in the cityscape. 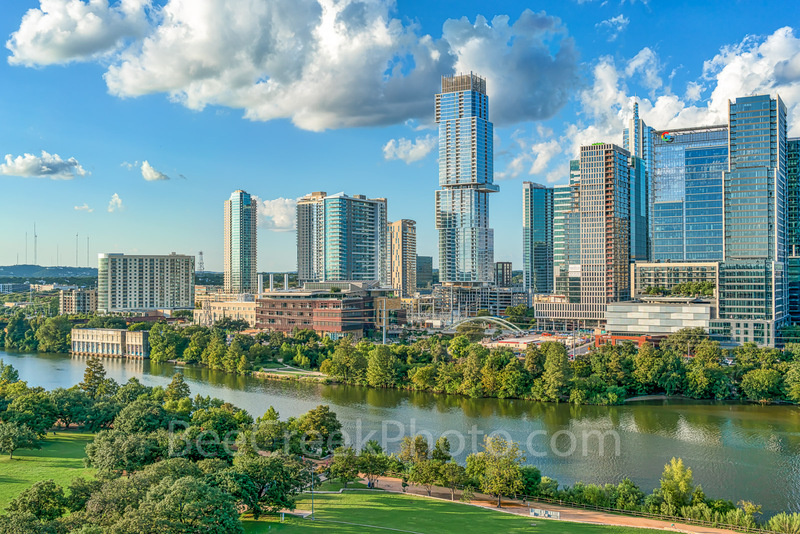 We like the new look of the Texas skyline in this view with lady bird lake and the hike and bike trail with all the greenery in the park. Photo © copyright by Bee Creek Photography - Tod Grubbs / Cynthia Hestand.